Word from the National Hurricane Center (NHC) this morning is that Isaac Ã¢â‚¬“ on the verge of hurricane status Ã¢â‚¬“ poses a significant storm surge and freshwater flood threat to the northern Gulf coast. Remember a recent report from CoreLogic warned that over four million homes along the U.S. Atlantic and Gulf Coasts are at risk of hurricane-driven storm-surge damage, with more than $700 billion in total property exposure. Along the Gulf coast, there are just under 1.8 million homes at risk, valued at nearly $200 billion, CoreLogic said. The Insurance Information Institute (I.I.I.) reminds us that the top 10 most costly flood events in the U.S. ranked by National Flood Insurance Program (NFIP) payouts are associated with hurricanes or tropical storms. Regardless of the exact track of Tropical Storm Isaac the next few days, you canÃ¢â‚¬â„¢t help but notice thereÃ¢â‚¬â„¢s an extremely large band of tropical storm force winds associated with it. In its 8am EDT advisory on Isaac today, the National Hurricane Center (NHC) reported that Isaac was a little stronger and noted that tropical storm force winds extend outward up to 185 miles (295 km) from its center. Florida, Texas, Alabama, Georgia, Louisiana and Mississippi have some significant insured coastal property values, according to the Insurance Information Institute (I.I.I.). Figures compiled by catastrophe modeler AIR Worldwide show the total value of insured coastal exposure in these six states was $3.8 trillion in 2007. ThatÃ¢â‚¬â„¢s slightlyÃ‚ under half the $8.9 trillion value of insured coastal property in hurricane prone states as a whole. But itÃ¢â‚¬â„¢s not just coastal property that could feel IsaacÃ¢â‚¬â„¢s effects. As Hurricane Irene demonstrated last year, the impact of a storm Ã¢â‚¬“ winds, floods, and rains Ã¢â‚¬“ can be felt far inland. A post over at the Disaster Safety Blog (official blog of the Insurance Institute for Business & Home Safety) observes that the 20th anniversary of Hurricane Andrew serves as a reminder that it only takes one storm to cause significant damage. Even if Isaac doesn’t make hurricane status,Ã‚ there’s some useful information in I.I.I. hurricane fact files and market share by state. Ever wonder how much Hurricane Andrew would cost insurers if it struck today? A timely report from catastrophe risk management and modeling firm Karen Clarke & Co (KCC) has the answer. According to KCC estimates, Hurricane Andrew would be three times as costly in 2012, causing close to $50 billion in insured losses today, compared to $15.5 billion when it occurred in 1992. 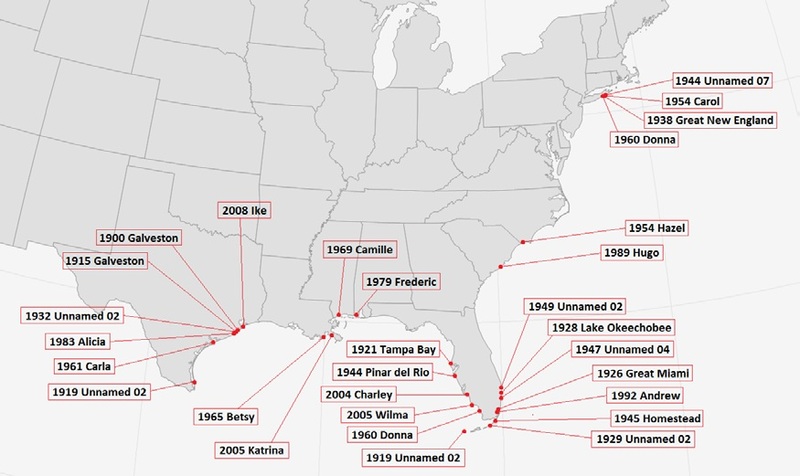 In fact, KCC has mapped out the landfall points of all 28 historical hurricanes that would cause $10 billion or more in insured losses today. A couple of things jump out from this map and the report. First, Florida has a target on its back. KCC notes that almost half Ã¢â‚¬“ 13 out of 28 Ã¢â‚¬“ of the historical hurricanes causing insured losses of $10 billion or more made landfall in Florida. Florida also has the largest loss Ã¢â‚¬“ $125 billion from a repeat of the 1926 Great Miami Hurricane. Another interesting fact from KCC is that there are three historical Northeast hurricanes that would cause $10 billion or larger in insured losses today versus just two in the Southeast. Here are some additional facts and statistics on hurricanes from the I.I.I. Food manufacturers are the target of a wave of new lawsuits filed by consumers who allege the companies are mislabeling their products and ingredients. The New York Times reports that lawyers of Big Tobacco lawsuits searching for the next big payday are now taking aim against food manufacturers. Some 25 cases have been filed against industry players like ConAgra Foods, PepsiCo, Heinz, General Mills and Chobani. According to the NYT article, the tobacco lawyers are moving particularly aggressively and seeking billions of dollars in damages. For example, they have asked a federal court in California to halt ConAgraÃ¢â‚¬â„¢s sales of Pam cooking spray, Swiss Miss cocoa products and some HuntÃ¢â‚¬â„¢s canned tomatoes. In response, the food companies say the suits are without merit, frivolousÃ‚ and being driven largely by the lawyersÃ¢â‚¬â„¢ financial motivations. The NYT writes that the lawyers are not the only ones who appear to be targeting the food industry. Recently, the Center for Science in the Public Interest has sued General Mills for using the term Ã¢â‚¬Å“naturalÃ¢â‚¬  on its Nature Valley products. A glance at the CSPI website reveals that Welch andÃ‚ Splenda Essentials are also facing deceptive health claims on their products. ItÃ¢â‚¬â„¢s worth noting that Ferrero, the manufacturers of Nutella recently agreed to pay $3 million to settle a class action lawsuit over misleading advertising that claimed the chocolate-hazelnut spread was healthy. In an earlier blog post, we noted the potential liability risk facing food manufacturers, advertising agencies and ingredient manufacturers to name a few from obesity-related tort actions. argues that food companies are violating specific rules about ingredients and labels and misleading consumers. This is why itÃ¢â‚¬â„¢s so important that food companies comply with federal regulation. You may not be surprised to hear that more than half of American cell phone users now have smartphones, according to a report in the New York Daily News. As Americans increasingly rely on their phones to do more than just make phone calls, there is a growing market for applications to enable those mobile lifestyles. While many apps fall into the entertainment category, the Insurance Information Institute (I.I.I.) has just launched a free mobile disaster preparedness app that could protect your home and family. Whether itÃ¢â‚¬â„¢s a hurricane, wildfire, severe winter weather, earthquake, or other disaster, the I.I.I.Ã¢â‚¬â„¢s Ã¢â‚¬Å“Know Your PlanÃ¢â‚¬  app for iPhone provides check lists and vital safety tips to help users prepare for catastrophe before disaster strikes. Ã¢â‚¬Å“Know Your PlanÃ¢â‚¬  provides consumers with a library of preloaded checklists to learn about important property protection and preparedness steps. Customized lists can also be built from scratch. Each checklist gives users options to set task completion dates, chart their progress and make additional notes for individual tasks. One of the cool features of the app is that in the event of a disaster, users will be able to access a geotargeted emergency alert feed guiding them to up-to-the-minute information about local evacuation routes and other details about the disaster. Also included are resources to help plan for an evacuationÃ¢â‚¬”including one for pets. Ã¢â‚¬Å“Know Your PlanÃ¢â‚¬  is available in iTunes, or by searching Ã¢â‚¬Å“Insurance Information InstituteÃ¢â‚¬  in the App store from any iPhone. All property mitigation information was developed in partnership with the Insurance Institute for Business & Home Safety (IBHS). Ã¢â‚¬Å“Know Your PlanÃ¢â‚¬  is the second in a series of apps created by the I.I.I. It follows Know Your Stuff Ã¢â‚¬“ Home Inventory app, which is available for both iPhone and Android platforms. At least one in five people is obese in every U.S. state, according to the Centers for Disease Control and Prevention (CDC). Latest data from the CDCÃ¢â‚¬â„¢s Behavioral Risk Factor Surveillance System show that obesity prevalence ranged from 20.7 percent in Colorado to a high of 34.9 percent in Mississippi in 2011. No state had a prevalence of obesity less than 20%. Some 39 states had a prevalence of 25 percent or more and 12 of these states had a prevalence of 30 percent or more: Alabama, Arkansas, Indiana, Kentucky, Louisiana, Michigan, Mississippi, Missouri, Oklahoma, South Carolina, Texas, and West Virginia. The South had the highest prevalence of obesity (29.5 percent), followed by the Midwest (29.0 percent), the Northeast (25.3 percent) and the West (24.3 percent). Note: due to a new baseline established in 2011 for state obesity rates, the CDC cautions that estimates of obesity prevalence from 2011 forward cannot be compared to estimates from previous years. A recent report from the Institute of Medicine (IOM) put the annual cost of treating obesity-related illness at $190.2 billion andÃ‚ said there wasÃ‚ an urgent need to strengthen prevention efforts in the U.S.
A raised hurricane season forecast from NOAA and a timely reminder from the Insurance Information Institute (I.I.I.) on flood insurance are our topics du jour. NOAAÃ¢â‚¬â„¢s updated seasonal outlook now anticipates 12 to 17 named storms, up from nine to 15 initially forecast. If you consider that to-date weÃ¢â‚¬â„¢ve already seen six named storms, that likely means thereÃ¢â‚¬â„¢s some significant activity to come during the seasonÃ¢â‚¬â„¢s peak period from August through October. While El NiÃƒ ±o is a competing factor, NOAA doesnÃ¢â‚¬â„¢t expect its influence until later in the season. Inland flooding from Hurricane Irene and Tropical Storm Lee last year caused significant damage for many home and business owners. AÃ‚ timely reminderÃ‚ from the I.I.I. urges homeowners to consider buying flood insurance. I.I.I. makes the important point that flood insurance covers your property against hurricane-caused storm surges as well as flooding generated by the torrential rains, which often accompanies tropical storms. Standard homeowners and renters insurance policies do not cover flood damage, but flood coverage, is available in the form of a separate policy both from the National Flood Insurance Program (NFIP), and from a few private insurers. Earlier this summer, after a series of short-term reauthorizations, Congress passed the Biggert-Waters Flood Insurance Reform Act of 2012 which renews the NFIP for five years. A Huffington Post piece by Wharton School professors Erwann Michel-Kerjan and Howard Kunreuther discusses the significant reforms to the NFIP as a result of this new law. Insurance Journal also has a great article by Lori Widmer titled What to Know about the New Flood Insurance Program. As the fifth named storm of the 2012 Atlantic hurricane season made landfall last night on the Yucatan Peninsula, far from U.S. coastlines, we take you back to 1992 Ã¢â‚¬“ a late-starting season that saw only six storms beginning with the historic Hurricane Andrew. — More carefully managed coastal exposure. 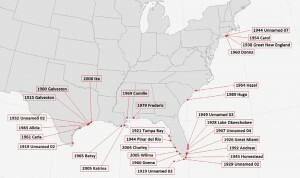 — Larger role of government in insuring coastal risks. — Introduction of hurricane deductibles. — Greater use of reinsurance capital from around the world. — The birth and rapid evolution of sophisticated catastrophe modeling. — Strong support for strengthened building codes and the importance of enforcement of these codes, as well as enhanced understanding of the necessity of mitigation. ItÃ¢â‚¬â„¢s worth noting that insurance claims payouts for Andrew totaled $15.5 billion at the time ($25 billion in 2011 dollars), and it remains the second costliest U.S. natural disaster, after Hurricane Katrina, which hit in 2005. A repeat of Hurricane Andrew on its 20-year anniversary would produce more than twice the losses of the 1992 storm, as much as $57 billion in insured losses, according to estimates by AIR Worldwide Corp. Check outÃ‚ I.I.I. informationÃ‚ on hurricane and windstorm deductibles.